When did you begin work on KH3? Nomura: I began to conceptualize it immediately following the completion of KH2. However, [true] development actually began much later than that, and at that time I supposed it would be released for the PS4 and Xbox One. There was a rumor that it was initially intended for the PS3, but by the time development began, the PS4 had already been released. Even before we switched the game engine from Luminous Studio to the Unreal Engine, it was already being planned for the PS4 and Xbox One. Unlike KH1 and KH2, this game's development was done by the Osaka team; what exactly was the reason for that? Nomura: Up until now, the Osaka team was responsible for things like KH BbS and mobile games, as well as KH Re:CoM and the remastered titles, but from the beginning there was a thought to have them do a numbered console game title someday. They had also gained experience with the KH series through non-numbered titles, and around that time the Tokyo team was working on a different title, so in this way I felt [the Osaka team was] ready to take on the challenge, and I tasked them with KH3. When development began, what did you request from the development team? Nomura: The first decided world was Toy Story's Toy Box, so I asked them to make battles where you could transfer between robots. Other than that, I told them that the main plan was to make a command menu where attacks with time limits would stack up. Later, when KH 0.2's production was decided, we included that arrangement (of timed attacks) experimentally. Utada Hikaru, who had done the theme songs up until now, took a very long hiatus, and there were worries about what would happen for KH3, but it appears that she safety returned to activity and was placed in charge of the theme songs this time as well. Nomura: Utada-san was asked to do new songs for non-numbered titles as well, but there was never an opportunity for that to be realized. This time around, though, when we humbly asked her to do a new song for the numbered title, there was a suggestion on her part to not do just an arrangement of the opening song, but to prepare another song, which made us very happy. I think the power of the KH fans from all around the world was what moved Utada-san to do so much. I thought that [the cause] couldn't be anything other than the huge amount of messages she received from the world over. Nomura-san, you are also an illustrator, so what kind of illustration were you thinking of doing this time? Nomura: At the very least, I knew I had to do the cover art, but the amount of characters is huge, so I was a bit depressed over how tough it would be [bitter laugh]. I've always used A4 size copy paper, so I try to fit in as much as possible. This time around I started drawing it on A4 paper as well, but once I had drawn Sora, Riku, and Kairi, I realized that there was no way everyone would be able to fit, so I put together two pieces of paper and started again. All the while I was thinking, "digitally I could just copy the first three I drew..." [laughs]. Right up until the deadline there were times I dragged [my feet] on it, and including coloring, I did it all in one week. For some reason the deadline for the international version was sooner compared to the Japanese version, so I thought "at this rate, the cover for the international version is just going to be black!" while I was racing to finish. After the release of KH2, the Disney Group acquired Pixar, so the list of worlds that appeared this time really grew, didn't it? Nomura: Actually, around the time KH2 was in development, we made some character test models from Monsters Inc. and Toy Story, and negotiations were done in order for the game to be released. In the end it was shelved, but for KH3, I thought that without Pixar, I couldn't release the game, so negotiations began [with this thought in mind]; the situation with Disney and Pixar had changed, so talks progressed in order to make this a reality. This time, even after the worlds [that appear in KH3] had been chosen, Disney and Pixar continued making really appealing movies, so there were a lot of times where I thought "I wanted to include that too..."
Including Monsters Inc. and Toy Story was a priority in KH3, wasn't it? Nomura: Even so, the hurdles we had to clear before that was decided were unimaginably high. Initially, I went to America personally two times for negotiations, and without a plot no progress could be made, so without even a main plot yet, I wrote the plot for Toy Box. After an extended period of back-and-forth, a conclusion was reached and we finally received permission. Since this was the first time Pixar came along with us [in terms of development], we built a relationship using Toy Story and made that the base, adding the other works [as worlds] later. In terms of the story in the Pixar worlds, it was a continuation of the stories in the movies, which surprised me. Nomura: Well, originally, the KH series has always seen Sora and his friends experiencing the [same] plot of the original movies as its basis, and [the worlds of] Tangled and Frozen are like this, too. However, in the cases of Toy Story and Monsters Inc, we were requested to show the "authorized history" of what happened after the events of the movies. Whichever [story] pattern the worlds have was largely influenced by the ideas of the creators and producers. The base stories of the [Disney/Pixar] worlds, as well as the stories of Sora and his friends were cleverly introduced. Nomura: Those are the achivements of Oka (Masaru Oka, the scenario and cutscene director) and the level design team. Recently in the KH series, I consulted with the level design team and Oka about locations and flow [of battle and events], and using Oka as a springboard [for discussion] I created the scenarios. In the end, although I had a hand in it as well, the flow of the dialogue and the stories of each world were largely handled by the level design team. The Disney Group has also added Marvel and Lucasfilm to its lineup, so the possibility of future worlds [to choose from] has increased even further, hasn't it? Nomura: That's right. However, in order to change those [properties] into a game, contracts must be made with each company separately, and there are cases where other game companies already have contracts, so although the Disney Group has indeed added those [properties], incorporating them into KH isn't so simple. That's also the reason Mickey is in only one scene in KH1. At the same time, another company was releasing a game that had to do with Mickey, so though we were denied his usage, we persisted and eventually got "as long as you only have one scene, from far away, as a silhouette, with him waving his hand or something". Since we had to make the best of the biggest [and only] chance we had, that's why that scene appears that way. Included in the worlds that appear this time is Olympus, which is a fairly "regular customer" at this point; do you have some emotional attachment to it? Nomura: Honestly, there isn't really a special reason, it's just by chance. It appears in KH3 since Sora has lost all of his powers and needs to get them back, and there was once a hero who regained his own powers in the same way, so it was a perfect fit for the start of the journey. If there's anything I have an emotional attachment to, it's that I wanted to include Hades. Hades is a fun character, so you kind of want to watch him [do things]. Speaking of "regular customers", 100 Acre Woods is, too. Nomura: It's because Pooh is a character that makes you feel relaxed just by being there [laughs]. From the beginning I thought to have 100 Acre Woods appear [in KH3] as a place you could take a breather from the main adventure and play some light minigames, since it would take time away from the development of the other worlds [otherwise]. In the 100 Acre Woods, there's a unique outline around the characters, right? Nomura: That wasn't added until the later stages of development, actually. In KH3, although we used something called the "Kingdom Shader" to change the feel of the material in each world, Pooh's world was left alone to make the graphics feel more like the original picture book, not an anime. Personally, in order to make the atmosphere feel more like a real picture book, I was particularly stubborn about the color of the sky. On the other hand, The Caribbean [in terms of graphics] looks incredibly like real life. Nomura: In a sense, the high image quality of that world was already decided. Around the time development started, in the video that was prepared for the in-house presentation meeting, scenes were created showing Sora diving in the ocean and riding enemies while flying in the air in The Caribbean. Additionally, the experimental reproduction of certain scenes from the movie [that were included] were so well made that they might as well have been the highlight of the meeting. From that point on, around the beginning of development, it was felt that that world would be quite high-level. By the way, the coat Sora wears in The Caribbean is actually based on one of my own personal coats that I gave to the staff with instructions to include it, but I feel like they don't want to give it back yet [laughs]. Talking about Sora's appearance in the various worlds, the way he looks in Monstropolis is pretty daring. Nomura: At first, I was thinking about something similar to the monster costume Boo wears in the movie, but Pixar gave the idea to actually change [Sora] into a monster. In Monsters Inc., there are a lot of detailed rules concerning character design, like the colors that can be used or the shape of the eyes, so after the design that was made to obey those rules was checked, I went and did the fine-tuning myself. Particularly, at the beginning, I couldn't give Sora's body a smooth feeling, so I covered him with fur, but Pixar pointed out that I shouldn't make him look too much like a cat, so trying to find middle ground was a struggle. That's why, although it looks like Sora has cat ears, those are actually horns [laughs]. In the worlds based off of CG movies, the quality of the reproduction [of the same graphics] is very high, so were you supplied with the graphic data from the movies? Nomura: We received some for reference, but because the number of polygons and the makeup of the data wasn't able to be re-used, we made everything from scratch to resemble the source material. For the camera work in the cutscenes and the number of cuts, the staff responsible watched the movies over and over while they were adjusting everything. The reason you can say "the reproduction quality is high" is all thanks to the efforts of the staff. Conversely, "Classic Kingdom", which is based on old LC (liquid crystal) games, was nostalgic to the generation [of players] who know that era. Nomura: My idea was, because each mini-game is modeled after a short film, just like the other Disney works, one mini-game would be treated as its own world. I say "world", but there's no map, and each mini-game has only one screen [laughs]. Personally, although LC games were extremely popular when I was a child, my parents never bought any for me, so when I grew up I bought them myself, and now I own dozens of them. I wanted to make a smartphone RPG using LC game-style graphics, so a proposal was made [to use them] for something not KH-related [in the past]. That deep desire changed form and was able to take shape. If it's possible, I'd really like to make a real "Classic Kingdom"-style LC game console. The Dark Seeker arc has concluded, but since when have you been thinking about the conclusion? Nomura: The Dark Seeker arc has been a concept ever since KH2. In those days, I just kind of threw together and decided an outline. I was often told by the manga artist that they felt "the characters come alive however they want", and some parts did change from their original conceptualization, but in the grand scheme of things not much changed. For example, it was shown in KH2 that the Ansem that appears in KH1 wasn't the real one, but was this decided ever since the beginning? Nomura: When I wrote the scenario in KH1, even I was thinking "Ansem calls himself wise, but doesn't he seem like a bad guy?" [laughs]. With that feeling as the catalyst, the scenes after KH2 reflected that. Xigbar, too; when he appeared in KH2, we had no idea he would be such an important person. Nomura: A lot of people say this, but at the time I wanted to show that "Xigbar is a character with a very special role" by giving him a suspicious way of acting. When we were doing dubbing for KH2, I listened to Houchu Otsuka (the JP VA of Xigbar)'s voice and thought, "This guy isn't just some organization grunt, there's definitely some hidden side to him", so the creation of the current situation evolved from there. It does sometimes happen that I get inspired to change the circumstances because of the voice actors' voices. The end part of the story, where all of the characters from both the allies' side and enemies' side were gathered in the Keyblade Graveyard, was incredible. Nomura: Fans all have different favorite characters, so I thought I should give each of them their own time to shine, but because the amount of things needed to be explained was too large, I had to find a way to have Sora move forward, at the very least. Actually, when the scenarios were being written, the Keyblade Graveyard part was the most difficult. If I focused on each character at a time, the progression of events would be quite slow, and the battles involving Sora were necessary to be shown, so making allowances for everything was difficult. The way I imagined it, all of the characters tied to each other should fight in order and put an end to everything [themselves], but if I did that, the explanations would end up being too long. On the other hand, if I made the enemies you can battle only a few people, and showed the rest via cutscene, that wouldn't have been very satisfying. After worrying about it quite a lot, with a certain intention in mind, I placed the emphasis on the pacing, and the way the plot unfolded was able to be brought to life. The Final World, a place very important to the story, appeared in the game, but what kind of world is it? Nomura: It is a place where those just a step from death arrive, connected to the Station of Waking. Up until now, the Station of Waking was always a dark place where the floor was made of stained glass, where the condition of the inside of one's heart could be shown, but in this case I made The Final World a place where I could show [that] more concretely, a place similar to a portal to [people's] respective hearts. Within the game, it's said that sleep and death are intimately linked, so if one's heart were in a state of sleep and they found themselves in the Station of Waking, the idea is that if they moved on from there, they would find themselves in The Final World. No characters from the Final Fantasy series appear in KH3, can you tell us the reason for that? Nomura: Put simply, they just couldn't be accommodated. There are too many characters that appear in the main story, so as a result the appearance of FF characters wasn't able to be prepared. Technically, polygon models were created for Leon (and some others). Apart from Leon, some other characters, like the Fairy Godmother from Cinderella, were made, but in the end they just weren't able to be used, which made some of the production staff angry. The contents of both the epilogue and the secret movie were quite shocking. In the case of the epilogue, characters from KHUx return, right? Nomura: Yes. Long ago, there existed Keyblade Masters called the "Foretellers", who traveled through time to be brought together again. Xigbar, as well, is actually another Foreteller named Luxu, who continually changed form through the ages. Xigbar says "With this, my role is finished". What exactly was his role? Nomura: He was tasked by his leader, the Master of Masters, to pass down the Keyblade he gave to him into the future, as well as another mission. This "other mission" is to be revealed. Halfway through the epilogue, we see that there are seven black pieces being used in the new game [of chess]. Are six of these supposed to represent the Master of Masters' six apprentices? Who is the last piece? Nomura: Well...you can guess, but it's a secret. Then, does the white piece indicate Sora? Nomura: Well, probably...in any case, the contents of the epilogue are meant to hint at the developments that took place before the Dark Seeker arc. I see. Then, continuing on, I'd like to ask about the secret movie; is the location connected to the ending? Nomura: Yes. After disappearing in the ending, Sora arrives in the world shown in the secret movie. Is the place Sora is in the same world as the one in The World Ends With You? Nomura: It looks that way. However, rather than saying Sora has gone to the TWEWY world, the meaning is that it's not exactly Shibuya, but ~Shibuya~ (note: this is hard to explain in English, but instead of it being written in kanji, the name for "Shibuya" is written in katakana here. This basically means it's not the same Shibuya as in TWEWY or in the real world.) Also, although Sora promised Neku and his friends that they would meet again in Shibuya, this video is not connected to that. Nomura: Yes, it is Yozora. So, is this the world of "Verum Rex?" In the last scene, who is the person in the black robe making a heart shape towards the moon? Nomura: That's the Master of Masters. He's the only one who would do such a silly thing looking like that [laughs]. How is the development of the planned DLC going? Nomura: Currently, I gave a list of things I'd like to have done concerning battles to the staff, who are in the process of going through it. As for additional scenarios, I told you just before that the final battle in the Keyblade Graveyard came to be [the way it is] because of a certain intention I had, so I think that's going to be the main focus. I'm hoping that it will be completed as soon as possible, but because development is happening alongside the preparations for the next project, I can't say with certainty when it will be released. For the time being, it's planned that instead of splitting up all the parts separately, everything will be released all in one pack together. Are you not planning to release a "Final Mix", as has been customary for the KH series until now? Nomura: There aren't any plans for a "Final Mix"-type package (sold separately). If I do make one, it would be in the form of DLC that included an English mode you could switch to. Additionally, we took recent player trends into account when we created the battles [for KH3], so we held back on the difficulty level, but there have been many requests to fight strong enemies, so I'm thinking that the priority would be on releasing a critical mode in the form of free DLC, and making the addition of strong enemies, the sort that would appear in a "Final Mix", paid DLC. Now that the Dark Seeker arc has concluded, there's a pause in the KH series, so now what is your attitude mentally? Nomura: I thought I'd feel relieved once it was over, but I don't feel that way at all. Now we're right in the midst of developing DLC, and it's coinciding with [the development of] a few other titles. I want to hurry up and start on the next project, so I don't feel like there's a pause. Nomura: Nothing has been officially decided yet, so at this point in time, I can't say anything. Right now, the top priority is on making DLC for KH3, and a huge update that's coming to KHUx. As far as the developments to come, I currently have two ideas, and something that requires me to think about it separately, so the next project will actually have to be two, I think. Even if we're talking about a hypothetical "KH4", there's something that must be written before it, so I'm looking into the possibility of sandwiching it between works. To all the fans: to realize the first step beyond the Dark Seeker arc, I thank you for your continued support. Nomura: On the cover art next to Ventus there's a cat that was partially modeled after Chirithy, but it's actually my own cat. Also, on the four corners on the top of the clock tower, the protruding objects there are actually people wearing black robes. Is the speech Sora gives in the opening, the one that begins with "They can take your world, they can take your heart," a monologue by Sora post-ending? Nomura: That's not the only answer, but the words do suggest Sora's mental state post-ending. In the Final World, Sora tells Namine, "Someone else special I know won't let you down." (*T/N: Literally, "the person you miss/want to see the most will come get you.") Did he mean Riku? Sora doesn't thank Namine in this game, either. Is this something that is going to be carried over into a future game? Nomura: Well, Namine's revival did happen at the end of the game, effectively making it something that will be drawn out longer. How did Ansem the Wise and Ienzo and the others move Namine's heart into a vessel without Kairi being there? Nomura: When Kairi was defeated the first time in the Keyblade Graveyard, Namine's heart was thrown into the Final World, right? And Namine's heart was also thrown out just before the final battle, when Kairi was hit by Xehanort's attack. I do plan to show the details of what happened after that. In the Final World, there was a "Nameless Star" whose scene was voiced. Who is she, and who is she waiting for? Nomura: I can't reveal that yet. But I can say that whoever she is waiting for, Sora knows their name. When we leave the Final World, we are back to the point just before Sora and his friends were defeated. Why is that? Nomura: The power of awakening is essentially "the power to put sleeping hearts back the way they were." But the impact of forcing his friends' fading hearts back the way they were rewrote reality, and created a singularity. The rewrite caused the chronology in which they were destroyed to have "never happened." How did Roxas appear at the Keyblade Graveyard? Nomura: At that point in time, Ienzo had basically finished making Roxas' body using the replica Vexen and Demyx brought as a base and the data from Twilight Town. This is also how Xion was manufactured using Sora's memories in 358/2 Days. When he was at a state where all he needed was for the heart inside Sora to return, his friends were in peril. So he used his connection to Sora to rush to the Keyblade Graveyard, where his heart returned to his new body and his revival as Roxas was complete. When Marluxia is fading, he says, "I am on the cusp of reclaiming my identity, my purpose for being." Did he remember that he was from the distant past? Nomura: Yes. I think if you play KH Union Cross to the end, you will learn his purpose for being. Nomura: Marluxia. It's not certain whether Larxene has her old memories, but she was interested in Marluxia to a degree for some reason, and became his partner in his plan to overthrow the old Organization XIII. Were Marluxia and Larxene also the Keyblade wielders of old that Xemnas was searching for? Nomura: It hasn't been made clear yet, but I believe those who play KH Union Cross can guess. By the way, Xemnas was also looking for the Chamber of Awakening in KH Days because Ventus, who was sleeping there, was a Keyblade wielder of old. So that means Xehanort was aware that Ventus was a Keyblade wielder of old? Nomura: Regarding that, I think I definitely have to show sometime how Ventus and Xehanort met. A question about Terranort. Ansem and Xemnas came from the splitting of Terranort. Does that mean that when they were defeated in KH1 and KH2, Terra was revived alongside Master Xehanort? Nomura: By all rights, Terra should have been revived as himself at that point in time. However, his heart was still in the clutches of Xehanort, and it was unable to go back, and the shell of his body was the only thing that revived. Then, Xehanort brought the heart of Terranort from the past and put it in that shell of a body he once controlled. From when was Terra's heart inside the Guardian? Nomura: Terra and Xehanort's hearts were eternally struggling against each other within Terranort. This process meant Terra's heart was caught constantly moving back and forth from its original position to the Guardian. By the way, the official name of the Guardian is "the guy behind him" (laughs). What happened to the Lingering Will after the battle? Nomura: When Terra was revived it caused the Will to vanish, and the armor disappeared. But Keyblade Wielder's armour is like a Keyblade in that even if it disappears, it can be summoned again so long as the wearer is in their usual condition. At the end of KH3D, we saw that the New Organization XIII was missing a 13th member. Who filled that spot? Nomura: Xion. The 12 members who were gathered in KH3D were missing the 13th, Xion, and reserve members Demyx and Vexen. That part may have felt a bit out of nowhere, and I am thinking of a way to follow-up on it. Did the members of the New Organization XIII have numbers? Nomura: I did think of giving them numbers at first, but I didn't go with it in the end because it was too confusing having some members end up with different numbers than before. For example, I had gone with No.1 as Master Xehanort, No.2 as Ansem, and No.3 as Xemnas. But then I thought people would get confused like, wait, so the guy who was No.1 is now No.3? When Young Xehanort is fading away, he says, "Goodbye Sora. Your time in this world is..." What did he mean? Nomura: "Your time in this world is over. "* It's hinted at in the ending. Before that scene, he warned Sora, "There's a high price to pay for wielding such power foolishly." The power of awakening is not the power to bring people back to life, but Sora was using it to do just that to his friends. As a result, time was rewound - and Young Xehanort predicted that Sora would pay the price by disappearing. Was Lea insisting on being called Axel so that when Roxas came back he would recognize him? Nomura: Yes, but also because when he saw Kairi as Xion, he remembered that there was someone he was supposed to remember, which made him feel that being called "Axel" was important. Why does Maleficent know about the black box from the days of old? Nomura: After KH1, she travelled to the age of KH Union Cross. When she returned to the present after that, the result was her rebirth in KH2. The act of "returning to the present time/going to the future" is connected to how characters from the days of old have ended up in the current time period. Nomura: She does think that. It hasn't been shown exactly when she began to think that way, but I do plan to reveal it soon in KH Union Cross. In KH BbS, Master Xehanort's goal behind opening Kingdom Hearts was to "create a new world." But in this game, he says it is to "reset the world." Why the difference? Nomura: What was revealed in this game was another piece of the truth: his goal was "this world is no longer any good, and we have to recreate it from scratch." We are interested in why Xehanort would come to such a conclusion. Nomura: At first, I did want to use a next game to dig down into how Xehanort went from that simple boy playing the chess-like game to an admirer of the darkness. But, if I do that, then the Dark Seeker Chronicle wouldn't have ended with KH3 after all (laughs.) Some ideas had solidified to a degree, but it's shelved for now. During the underwater section in Scala ad Caelum, you can see a clock tower like the one that appears in KH Union Cross. Was Scala ad Caelum built upon the ruins of Daybreak Town? Nomura: Yes. The staff who drew the concept art came to me with two proposals for the clock tower: one standing normally on the seabed, and one hanging upside-down from the surface of the sea. I chose the upside-down one. What was the true identity of No Heart, who appeared in KH BbS FM? Nomura: That was also Master Xehanort. That was the armour he used to wear a long time ago, and in this game he was wearing his current armour. Who specifically are the "lost masters?" Nomura: The seven (Master of Masters and six apprentices) who appear in KH X BC. When Luxord was fading away, he gave Sora a "Wild" card. What did that mean? Nomura: That will come into play later. Perhaps Luxord's card holds the key to Sora's revival. All of these are contained on two discs, and comprise the entire series except for Union χ and Kingdom Hearts III. If you or anyone you know are looking to get into the series, this is the game to buy! The Story So Far will release in Canada and Latin America on March 15, and in Europe on March 29. In addition, the United States is receiving restocks for the game if you missed your chance with the first run. It's been almost 17 years since Kingdom Hearts released on March 28 2002. And, in Kingdom Hearts III, we have come to a point of punctuation: the end of the "Dark Seeker Saga," which has lasted for these past 17 years. The worldwide release of KH3 was a success, with over 5 million units sold. Having received such a large response all over the world, please tell us what you're feeling about getting here. Nomura: In the way of numbers, looking at the exact data that includes digital copies, it's a great result that has completely passed my expectations. We are currently beginning work on DLC, so it doesn't feel like it's over yet. I'm actually getting less sleep post-release. There's a form that appears called "Rage Form," which reminds us of the "Anti Form" from KH2. What is the setup behind that? Nomura: The forms in this title are very different from that of KH2, so we decided to change all the names. Rage does indeed have characteristics that are reminiscent of Anti, but it's basically a separate thing setup wise. Anti is based on Sora getting completely stained in darkness, but Rage doesn't go quite that far. It's based on him going into a rampage state, controlled by feelings of anger. There's no "Critical Mode" difficulty level in this game. Was there a reason you didn't include it? Nomura: Critical Mode wasn't originally in the base versions of the game, they were an extra feature we added to the Final Mix versions. So, we will be following that and releasing it for download later on. It's not simply a matter of changing numbers and making things stronger; we fine-tune and debug multiple times. We are polishing things to make sure it's not simply a "more difficult mode," and is as fun as you would expect from Critical. Among the worlds, we felt that the plot in the Big Hero 6 world had rather daring plot developments. Most of the worlds in KH3 were new to the series. Can you tell us which world's story left the deepest impression on you, or any stories from development? Nomura: Toy Story was the first plot we worked on. The scenario took over 2 years to complete, and we even went and consulted directly with Pixar. It's a symbol of the beginning of KH3, and as such is the one I have the deepest memories of. There are several Organization members whose original names are still unknown. Will we have a chance to learn them someday, or to find out about the scar on Isa's face? Nomura: If there is a sequel, then that chance may come. But in my heart right now my desire is a blank page. The process behind reviving Ventus and Roxas was fairly easy to understand, but how was Xion brought back, and how did she end up in the New Organization XIII? Nomura: I think it's possible to figure it out for yourself. However, I do plan to explain it in DLC. Many people who have finished KH3 are interested in the "girl" that Lea and Isa were looking for, and the existence of the "NAMELESS STAR" in the Final World. Can you give us any kind of hint about the truth behind these girls? Are they characters who have already appeared in the series? Nomura: I think this is also possible to figure out for yourself if you look at all the secret reports, but yes, they are characters who have already appeared in the series. You will find out who "NAMELESS STAR" if there is a next time. What is Scala ad Caelum, the place which also appeared in the final trailer? It looks similar to Daybreak Town from Kingdom Hearts Union Cross - is there some kind of connection? Also, who were the black-clothed figures that appeared there? Nomura: I've made it so that you should be able to understand the connection between Scala ad Caelum and Daybreak Town, if you look carefully. The black-clothed figures are replicas. Please give us a comment, if you can, regarding the post-release download epilogue and secret movie. We are interested in the existence of Yozora from VERUM REX, who also appeared in Toy Box. 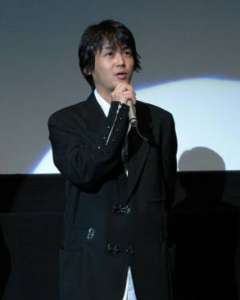 Nomura: As I have done in the past, it is an introduction to the story I will tell if there is a next time. I know there is all kinds of speculation regarding the secret movie, but it's not something simple that could be understood at this point in time. Finishing KH3 got us even more interested in the plot of KHUX. Please tell us what is in store for us there. Nomura: We are approaching a development that brings a new world. Along with it, the main story is going to get moving in a big way, and pieces that have been a mystery until now will begin to gather. Please tell us about your plans for post-release updates and DLC. Is there the potential for something like a Final Mix? What is coming next in the Kingdom Hearts series? Nomura: Up until now, we have created Final Mixes as separate packages. However, this time I am hoping to release all extra elements as DLC. We are planning to release free DLC as updates once each piece of content is finished. We are also planning to release several features together in one batch as paid DLC. This means that it will take a little more time to work on, but I do want to finish it as early as possible this year and have the team start work on our next project. As for the future of the KH series - there have been some talks, but the ifs and whats are truly a blank page right now. My schedule is completely full for the rest of the year. Sky Tree, the Ambassador Hotel, Square-Enix Cafe, Walkman, and the upcoming concert world tour: KH3 has certainly been showcased through a humongous number of channels. Which were most memorable to you? Is there anything else still to come? Nomura: I was surprised by the Ambassador Hotel one. I was grateful for each and every collaboration. I think that perhaps for now, we have seen everything that can be announced. Remain seated, please. The worlds that captivate realm dwellers and controller holders alike will soon be welcoming Disney and role-playing fans to pull up their favorite gaming chairs for an uncharted tabletop experience. Introducing Talisman: Kingdom Hearts Edition, The OP’s licensed version of the critically-acclaimed adventure hobby game, which combines the beloved Disney and Square Enix collaboration with Games Workshop’s time-honored board game mechanic. Available in North America and Europe later this year, players will assume the role of their favorite animated heroes from beginning to center of a new challenge! Following the release of award-nominated video game Kingdom Hearts III, the celebration continues as Talisman: Kingdom Hearts Edition reveals Sora, Kairi, Riku, King Mickey, Goofy, and other comrades as figures at the helm of an exciting and different way to play the tabletop classic. Inspired by the original Kingdom Hearts video game franchise, the 2- to 6-player game’s objective compels players to acquire the needed Strength and Magic to seal the Door to Darkness and keep Heartless from consuming the communal worlds. An artful gameboard with three regions, custom marbleized six-sided dice, tokens, and cards maintain the beloved aspects and exploratory spirit of “The Magical Quest Game” while offering lighthearted Disney nostalgia. Memorable locations such as Neverland and Traverse Town, Munny-themed currency, Gummi Paths and more will comprise a brand new experience by incorporating much-loved characters, worlds, and details from the Kingdom Hearts universe, surprising and delighting fans everywhere. Talisman: Kingdom Hearts Edition is at the forefront of The OP’s recently announced partnership with Games Workshop, and enthusiasts can expect more dynamic titles to come from the collaboration! Until then, set your sights on The OP’s Facebook, Twitter, and Instagram channels for more information, and prepare to besiege your local game store for Talisman: Kingdom Hearts Edition, the immersive new way for loyal followers and their friends to get lost in both multi-faceted worlds! With only two days (!!!!!) to go until the long awaited release of 'Kingdom Hearts III', Square-Enix uploaded English versions of the Memory Archive videos narrated by Chirithy that recap the series and will be included in the game itself. Check out the videos by going to the official Kingdom Hearts YouTube channel.